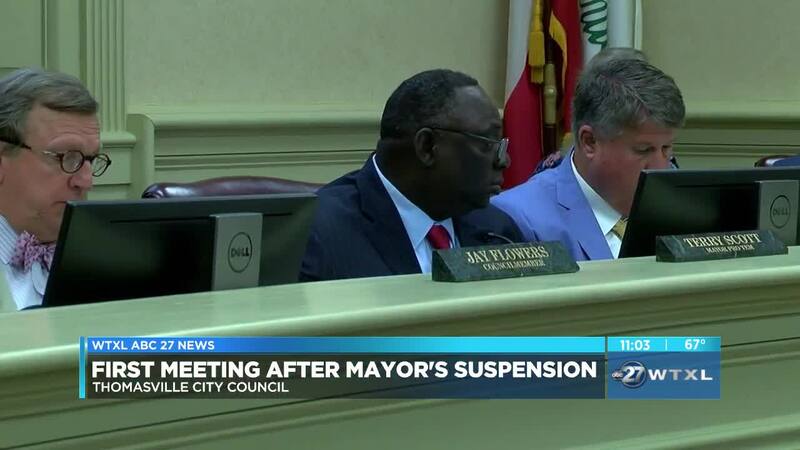 THOMASVILLE, Ga. (WTXL) — Thomasville held it's the first city council meeting on Monday since Governor Brian Kemp suspended Greg Hobbs from his duties as Mayor. Many in the Rose City community say they're still in shock over Mayor Hobbs' not sitting at his usual seat on Monday night. Despite some citizens saying they wish the council had addressed the issue city leaders haven't given new information following the Mayor's immediate suspension on the 2nd. Others who live in the Rose City say they're happy to see things running as normal with Monday's meeting. "As a whole the city will begin to heal from this. I know it's kind of a bad thing but I really hope the citizens will now come together and begin to try to heal and work together and let's get Thomasville back," said Veronica Scott. As of April 8, there is no opening for a mayor or council member posted on the city website. In fact, Greg Hobbs is still listed as the Mayor. Thomasville's municipal code says a vacancy that happens in the first 2 years of the term for a council member including the mayor could involve a special election. The city is not responding to questions about this possibility. That may not yet apply to this case because this vacancy so far is temporary. If Hobbs is found "not guilty," he could return to the council. We do want to reiterate the City of Thomasville says Council will appoint a temporary replacement for Hobbs at one of the regular council meetings. Which one?? The city is not saying. Those meetings fall on the second and fourth Mondays of each month.